“The life of our city is rich in poetic and marvelous subjects. The quality of life in cities is increasingly ranked against a series of measures. The criteria for what makes one city more livable than another is debated. Can the quality of city life really be reduced down to a series of metrics? Livability assessments often measure the more tangible elements of cities, generally focusing on political stability, healthcare, education, infrastructure, environment, culture, housing, safety and business conditions (1). Many of these rankings are designed, not to understand quality of life for the locals living there, but to help companies to understand living conditions in different places so that they can adequately compensate and entice expatriates for working abroad. 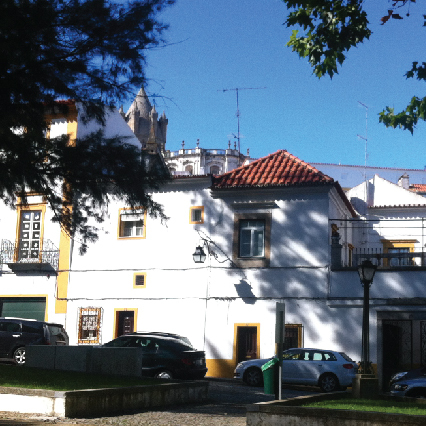 I was recently one of those expats, sent to a little town called Évora in Portugal with my husband for his work. As I started my journey, adjusting to a new place, in my mind were lots of questions about what would be the elements which impacted my quality of life and would my quality of life be different to Melbourne or Seattle. There were the words of many theorists circling in my head. Jane Jacob's writings on the vitality of local communities would sometimes pop up. I would consider Richard Florida's hypothesis that a city's level of tolerance for different people as the critical factor for attracting the most talented and innovative workers which help to propel the economy. A single sentence in Edward Glaeser's opening chapter in Triumph of Cities would capture my thoughts: "A mayor who can better educate a city's children so that they can find opportunity on the other side of the globe is succeeding, even if his city is getting smaller." A few weeks into my journey, a new book was released. I am sure I was one of the first people in Portugal to buy Happy City by Charles Montgomery. Charles starts his quest for understanding the relationships between cities and happiness with a story of pedaling behind Enrique Peñalosa, former mayor of Bogotá, to learn about his vision to define the success of his city not by economics but by his citizen's happiness. I had met Enrique's brother, Gil Peñalosa, a few years before when I worked for the City of Melbourne and had listened to him enthusiastically speak of the simple things that matter in making a city livable. Most importantly to Gil, was the need for cities to be designed for inclusiveness to ensure everyone could participate in city life. It was hard to debate with the Peñalosa brothers on what makes a livable and happy city. "We need to walk, just as birds need to fly. We need to be around other people. We need beauty. We need contact with nature. And most of all, we need not to be excluded. We need to feel some sort of equality" ― Enrique Peñalosa in Happy City by Charles Montgomery. These words reminded me of an article I'd read a few years before by Canadian city planner Brent Toderian, discussing several interesting points on the merits of livability rankings. He mentions many elements he believes don't get appropriate attention in the criteria and how the results make many question their city life - how resilient is their city? is it friendly? are there enough random acts of kindness? He writes about a book he came across called The World's Fairest City which proposed a different set of criteria against which to measure a city's livability. A few of my favorite: how often do you meet someone you don't know in your city? ; how do people greet each other? ; can you find your way without a map? ; can you be what you really are? Undoubtedly these questions are incredibly important in how an expat will settle into a new place and their daily quality of life. Excited and anxious about my temporary life in Évora, these very questions reflected my greatest fears in arriving in my new country and city. Would I meet any friends during the long days my husband was at work? Would I be able to speak enough Portuguese to get by? How often would I be lost? What if I didn't fit in? What defined my quality of life in Évora, a walled UNESCO World Heritage city, were not the elements which I had found assessed by the mainstream livability surveys. Although I was in a city which centered around its university, I knew little about the standard of education. I was relatively unaffected and rather oblivious to the political situation. My husband's company had figured out our accommodation. I was fairly disconnected from everything to do with housing in Évora - I had no idea how much rent was and if it was affordable for locals. The livability measures seemed much less relevant to an expat experience in some ways - and more critical to a local. Not to discredit these measures - undeniably these factors would be more important depending on your experience - if you required medical assistance, or if you had a school aged child, or if you were in a unstable place. It was a series of moments, a chance encounter and the kindness of one stranger that had the biggest impact on my quality of life in this new place. On the first long day in Évora I would explore the city, trying to get my bearings, observing interactions on the street, in parks and in the square to try to fit in a little. The first mission was to get to the tourist office to get a map - with my phone, I took a photo of my street name in case I couldn't remember it or pronounce it properly if I got lost. It was a slow day trying to test my Portuguese - sometimes it worked and other times didn't. My introduction to this new place was fairly solitary. Thanks to my Portuguese friend Ana in Seattle - who I had met by chance and who had been so kind to teach me about the language and culture - I could sustain enough conversation to checkout my items at the supermarket, or to ask for directions or order a coffee and a pastel de nata. My days were spent finding an interesting scene to sketch and watch people in their daily rituals. Coming from a Seattle summer (which is more like spring weather) I would be dressed in light clothes while the locals were rugged up - I soon found out that in this small city, I stood out a little. They could tell I wasn't from Portugal before I even tried to speak. In such a tourist city, foreigners were often considered a bit of a nuisance, visiting for a few days, eating and drinking and then heading off. I would learn that Spanish tourists were the most demanding and although all tourists were the subject of mockery, few Australians visited so I would be more welcome than most others. Thanks to Ana and our many meetings over a cafezinho (little cup of coffee) in Seattle, I had enough Portuguese words to one day, walk into the tourist office in Praça do Giraldo and enquire if they knew anyone who could teach me more Portuguese. I knew that understanding more would be the door to being a part of the city's life. Without better language skills, so much would pass me by. After some awkward discussion I was directed a few doors down to a tutoring school - upon the closed door was a tattered sign - under "Curso de línguas" it said "Português p/Estrangeiro". I took the number and after a few days of working up the confidence, I called, introduced myself and enquired in my very best Portuguese about language classes. To this day I am not super sure what I said, speaking on the phone was much harder. The lady made me aware she couldn't speak in English but with a nice mix of French when I misinterpreted the Portuguese, she managed to tell me that despite the sign, the school didn't offer Portuguese classes for foreigners, but she would find me a teacher and get back to me. After week or so they had found a teacher who was prepared to meet with me for a two hour class twice a week. As I became increasingly lonely in my conversation-less adventures around Évora, I couldn't wait for the first class. In the first few moments of meeting Patrícia she reassured me that even though she was young, she was hardworking and I would get the best value out of having her as my Portuguese teacher even though she had focused on teaching Portuguese people to speak English, Spanish and French. At the end of the class Patrícia told me she had to make a trip to her university and she invited me to walk with her. As we walked she showed me some of her favorite places and introduced me to her friends we bumped into (one shared it was her dream to one day move to Townsville!) She had only known me two hours but went out of her way to make me feel at home in Évora and show me a side of her home I would otherwise have not encountered as a visitor. As we walked past the tallest point in the city, she pointed out the other towns on the distant horizon. Évoramonte, she explained was one of the little peaks - a town across the plain which in the old days would communicate with Évora, with flag signals or even fire if necessary. She showed me these beautiful parts of her university and told me about its history. She said, although sometimes when she is at university her mind might drift, she would look at the beautiful tiles on the wall and think how lucky she was. Patrícia's tour went for as long as my first class. It astounded me that this young intelligent person who was busy studying her Masters and working, would be so generous to welcome a complete stranger to a new city. She surprised me with how much she knew about my hometown Melbourne - "Aren't the best restaurants on Lygon Street?" then would fess up that she was addicted to watching Masterchef Australia - I thought it was hilarious it would be shown on Portuguese TV. Aside from the 2 classes per week, she would meet up with me to show me a great cafe or take me on a drive to a great view point over the city. Sometimes she would be studying in the library and would invite me to meet her there - this library became my haven on rainy days in Évora when I had run out of things to do - it was a place I wouldn't have really known about as a visitor. She would ask me about my plan for the weeks and discourage my visits to Lisbon to instead visit the surrounding villages with her advice on the best places to explore. With such kindness, Patrícia invited us over for a family dinner. Their family made me feel connected to this new place, it was my mini-Melbourne, surrounded by Roman walls! It was amazing how quickly Patrícia became a great friend. Her kindness and generosity had such a profound impact on my experience in Évora - I had a wonderful friend to talk to and spend time with who was always patient enough to help me with my Portuguese and encourage me to keep exploring. The simple acts of kindness of one stranger was all that was needed for me to feel welcome, settled, comfortable and safe. And while the traditional livability measures provide a good basis for understanding quality of life, it is sometimes the little intangible moments between humans which resonate the most. 1. The Economics Intelligence Unit Global Liveability Ranking evaluates stability, healthcare, culture and environment, education and infrastructure. Mercer's Quality of Living Survey measures political and social environment, the economy, environment, socio-cultural environment, medical and health considerations, schools and education, public services and transport, recreation, consumer goods, housing and natural environment. Monocle Magazine also publishes a Quality of Life Survey which factors in safety and crime, international connectivity, climate and sunshine, quality of architecture, public transportation, tolerance, environmental issues and access to nature, urban design, business conditions, proactive policy and medical care.